This custom MIDI Thru / Switch box allowed fast access to 10 MIDI devices. It provided 10 MIDI Thrus, switchable between two different inputs. Input 1 was additionally switchable between two inputs (1:A/B + 2:C). When used with two synchronized sequencers, this device could allow simultaneous access to as many as 32 devices and MIDI channels. 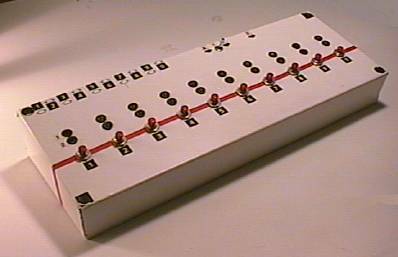 Each output had a corresponding LED pair to indicate which input it was connected to. It was most often used with the Amiga computer's Music-X sequencer software. Music-X was later replaced by Bars & Pipes Professional software, and this device was replaced by a custom designed rack mountable MIDI processing system called the MIDI Brain; which provides full access to 64 devices and MIDI Channels with built-in group/channel monitoring, a MIDI densitometer and numerous other features.